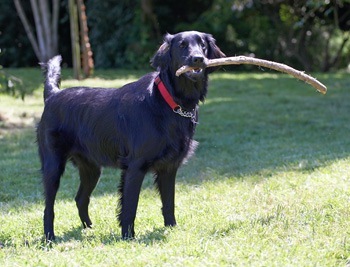 I am a black Female Flat coated retriever Dog. I am 9 years?young and weigh 65lb. I live in cold spring harbor, New York. I absolutely love to be the center of attention! I am a real people dog, and love to spend my time with my favorite humans, just doing stuff. Like most retrievers, I love to swim and enjoy staying active. I am also a real foodie, so my owners have to make sure that I don’t eat too much to keep me healthy and in good shape. I get along very well with other dogs and am good with children. I have not met a cat, but I think I would like them too (as long as they like me!). ?I love to play with toys, and really enjoy my treat toys, that will be coming along to my new home with me. I am being rehomed by my owners, who are very sad to have to make this difficult decision. Our home has been overrun with small children, and with 3 of the little stinkers under the age of 5, the environment is far to chaotic for me. At my age I need a more quiet home with a predictable routine, and owners who have the time to provide me with the attention and affection I need and deserve. They are dearly hoping to find me a wonderful new home, and would love to keep in touch and even visit me in my new home – if that’s OK with you. I’ll bring all of my supplies with me. I can’t wait to show you what a wonderful, smart and funny dog I am. Please offer me a loving home today! There is a $25 adoption/rehoming fee. Supplies will be included. Sophie’s Favorite Toys, Foods, Activities? Why is Sophie Being Rehomed?